Volvo has unveiled the all-new XC90 ahead of its official launch at the Paris Motor Show in October. The second generation SUV will reach the UK in May 2015 and be offered in two or four-wheel drive, with the choice of petrol, diesel or hybrid powertrains. 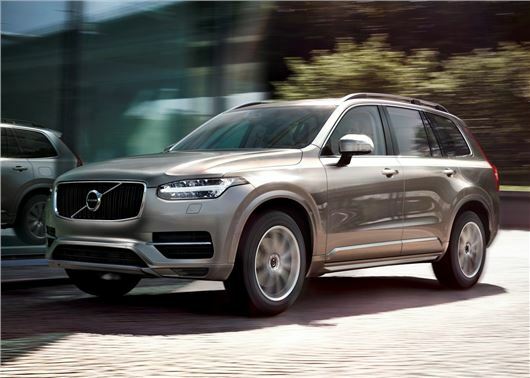 The new Volvo XC90 will be available to order in the UK from October and prices will start at £45,000. Developed over three years and part of a £6.5 billion investment programme, the new XC90 marks a new chapter for Volvo and its Chinese owners and the SUV gets an all-new platform, futuristic styling and a new range of ultra-efficient engines. The Twin Engine plug-in petrol hybrid will top the XC90 range, with a 2.0-litre, four-cylinder supercharged engine and turbocharged engine powering the front wheels, while an electric motor will drive the rear wheels. No details on fuel economy have been released, but Volvo is heralding the Twin Engine as a significant step forward for efficacy. According to official figures, the powertrain will return a Porsche Cayenne rivalling 400PS, but emit just 60g/km of CO2. The rest of the engine line up will consist of new petrol and diesel engines and the new powertrains will be 2.0-litre, four cylinder, units linked to an eight-speed automatic gearbox. The XC90 gets the option of electronically controlled air suspension, with the choice of five modes, including one where the driver is free to tailor the settings to his or her personal taste. The interior has been redesigned, but will be familiar to many XC90 owners, with wood finishes and a large central colour display. However, Volvo has attempted to make the interior ‘button free’ and the touch screen display will control the majority of the in-car operations. The new XC90 will be offered with a range of Internet-based products and services too, which will include music streaming, apps and online sat nav. Volvo is describing the interior as one of the most luxurious to have been designed for one of its models, with soft leather, crystal glass gear stick and diamond-cut controls for the start/stop button and volume control. As with the first generation XC90, which was launched back in 2002, the Swedish SUV will be a seven-seater and the third row will have enough for passengers up to 170cm tall (five foot seven inches). As you’d expect, the new Volvo is packed with safety kit, which includes run-off road protection package and automatic braking. In the event of the XC90 leaving the road, the car will detect the impending impact and tighten the seat belts to prevent spine injuries. The seat frames and cushions will also be energy-absorbing, to help further reduce impact to the car’s occupants. The XC90 is also available with automatic braking, which will apply the brakes if the driver pulls out onto oncoming traffic. The system will also be able to detect cyclists and pedestrians and apply the brakes if it detects a potential impact. To celebrate the launch of the new XC90, Volvo is releasing a limited First Edition model which will be filled with options and kit. Just 1927 First Edition models will be available - individually numbered to celebrate the year Volvo was founded - and they will only be available online via Volvo's website. The recommended retail price for the single specification First Edition is £68,000 and the online store opens for business on 3 September at 3pm.